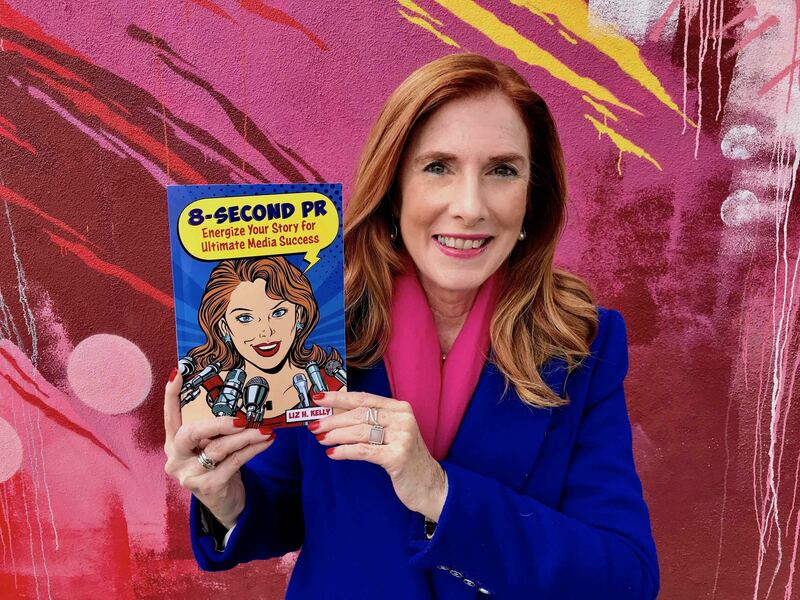 PR Founder and Author Liz H Kelly just released a new book “8-Second PR: Energize Your Story for Ultimate Media Success.” And her insights are from all sides of the camera as she is an author, publicist and red-carpet reporter. Take a closer look at her marketing and public relations tips to get your message out there, along were her transition from as a corporate employee at myspace to entrepreneur. Thanks for doing this! Have you really been doing this for 15 years? Yes, I wrote a dating book, and got 500 media interviews, and then decided to do marketing and PR for other people. It was 5 years promoting my dating book (“Smart Man Hunting”) and 10 years promoting other people full-time. What is one of the biggest tips in your new book, “8-Second PR”? PR is a marathon, not a sprint. A lot of people think, I have a new book, let’s just promote it for 3 months, and then we’re done, and that doesn’t work. You have to keep revising your story pitch to the media, and that’s how I got a 5-year marketing campaign out of one dating book. I released it three different times. And every time I released it, I updated it with new content that I knew the media would like. I could then go out to the media and say, “here’s what’s new.” I was constantly tying the book to current events, which is something we talk about in “8-Second PR”. I thought, Obviously I have a knack for this, and I don’t need to be on TV, so let’s get other people on TV. What do you mean by “it’s all about the story”? The sub-title of “8-Second PR” is Energize Your Story for Ultimate Media Success, and the reason why that is so important is because “it’s all about the story” and that is what I love doing. What I mean is that you can’t just pitch the media about a “cool new book or company”, you need to present a story about how you can help other people and how it ties to current events. For example, we decided to launch “8-Second PR” it in January because it’s about pushing your business forward, which is a better topic tied to new year’s resolutions versus having it get lost over the holidays. Is social media changing things? Do you need PR and social media? I think you have to navigate both. The book includes a chapter on social media, and I teach Digital Marketing at UCLA Extension. The title is also tied to the fact that the average attention span of an adult is 8 seconds, and many will decide in the first 10–15 seconds if they are going to continue watching your video. What would be your 8-Second elevator pitch? What I like to say is this “8-Second PR” book is going to help you build Raving Fans, increase your income and change lives. What the media really cares about is how are you changing lives. What roll does PR play in the scope of the media and the client? I think PR is a bridge between the media and content providers. I have a 360-view as an author, marketing professional and reporter. I have stood on red carpets and interviewed celebrities, and you get some good interviews and bad ones. Instead of rambling, the best interviews are ones with a 1–2–3 punch in their story. Without proper understanding of framing your story, does the message get lost? I provide some media coaching for our Goody PR clients, but the bottom line is that I want them to sound like themselves and be excited. The body language, enthusiasm and what you wear all play a role, and we talk about it in “8-Second PR”. There is a lot to it, and I watch pundits on cable news all the time. The ones who are really good interviews are the ones who say, the top 3 things are…or Number 1 and Number 2 are, those are the ones that get your attention. Otherwise, it just sounds like a monotone voice. Knowing the psychological components is very important, and packaging it with numbers is so important for understanding. Is that right? What I say in the book is use “emphasis statements” to get their attention in 8 seconds. For example, if I say, “the most important thing is”, that can grab your attention in 8 seconds. I can’t say the whole story in 8 seconds, but I can get their attention immediately. What advice do you have for someone who wants to promote a hobby or start a new career? First, you definitely want to be very passionate about launching a new project or brand. Second, you need at least one year’s salary of savings in the bank. For my dating book, I probably invested $100,000 in time and money in this the project, which included going to seminars like Mark Victor Hansen’s book marketing seminar (he wrote “Chicken Soup for the Soul”) and hired two Publicists for $20,000. When I started my PR business, I also did work for a year for free to build a portfolio by working with Rich Dad Hawaii, then Rich Woman and then finally getting a client who worked on those projects — who is still my client now 10 years later. What do you look for when deciding whether to work with clients? The first thing we look at is whether the company is making a difference. And if they don’t have a charity, we help them find one that aligns with their brand. The second thing we look at their “attitude” and communication process. If a client wants us to only communicate with their Assistant, that doesn’t work because we need to be able to talk to them and find out what they are thinking on a regular basis. For example, we’ve had one client for the past four years, and we have one monthly strategy meeting for an hour that works well. We don’t need to talk to them during the month except via email and text if there is an interview request. What I am hearing is that there have to be a level of “You” in your PR. Is that right? Yes, that is a really good point. One of the things that I talk about in “8-Second PR” is that “it’s not about the cool company or cool book”, it’s about the story behind the story. You want to have a spokesperson with a powerful story. The story also has to be relevant and timely by connecting it to current events or headline news. We did a great PR campaign for Warriors Heart Foundation connected to Flag Day, Fourth of July and flags made at WarriorsHeart.com by military, veterans and first responders with US Air Force Col (ret) Chris Sticklin that was a huge success, resulting in 3 TV interviews in 3 weeks. What advice do you have for someone looking to hire a PR company? My best advice would be to look at the company’s testimonials and portfolio of work. To help set expectations, ask them about monthly goals. And ask them to share examples of previous campaigns and results for clients in similar fields. For more information and to get a copy of the book, follow @LizHKelly, visit http://GoodyPR.com or http://8SecondPR.com.